TUCSON, Arizona – The iconic DeConcini Building at 2525 E Broadway in Tucson sold for $4.725 million ($147 PSF). 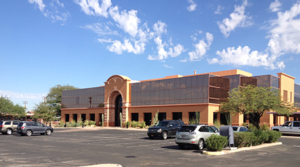 Leasing was handled by Frank Arrotta and Doug Richardson of Tucson Realty and Trust. The DeConcini family built the building in 1988 and sold it about eight years ago to the seller. Half of the building continues to be occupied by the DeConcini Law Firm. Other tenants include Salinas Insurance, Tucson Realty & Trust, The Veteran’s Administration and Sunstreet Mortgage. Tom DeSollar, Broker, of Arizona First Properties LLC, represented the sellers, a local group of investors. Brandon Rodgers, CCIM, of Cushman & Wakefield | Picor represented the investors. For more information, DeSollar should be reached at 520.400.2732. Rodgers can be contacted at 520.546.2714. To learn more, see RED Comp #6507.